I have neglected to explain the layout of the chord maps. The keyboard is straightforward: The white keys and the black keys on the image correspond to the white keys and black keys on an actual keyboard. The specific notes of a chord are marked by their respective note names on the keyboard. The guitar fretboard map is a little more complex: It's supposed to be oriented like you're looking down on a guitar you are playing. On a real guitar, the thicker strings are usually closer to your face, so that's represented on the map by being closer to the bottom of the page. The thinner strings are closer to the top of the page. From thickest sting (lowest on the page) to thinnest string (highest on the page): Low E string, A string, D string, G string, B string, and high E string. I assume that your guitar is tuned to standard tuning, from low to high: E A D G B E.
The specific notes of a chord are also marked by their respective note names on the fretboard. On the guitar, leave the low E string open. With your index finger, fret the A string behind the 2nd fret (1). With your middle finger, fret the D string behind the 2nd fret as well (2). Leave the G, B, and high E strings open (o), and strum all six strings. This finger position is just right for the Em ... for now. In certain situations, you might fret this same chord shape with just your index finger over the A and D strings, with just your middle finger over those two strings, your middle and ring fingers instead, just your ring finger, or your ring and little fingers instead. The possibilities are many! Just keep that in mind as strategies for efficiently switching between chords. 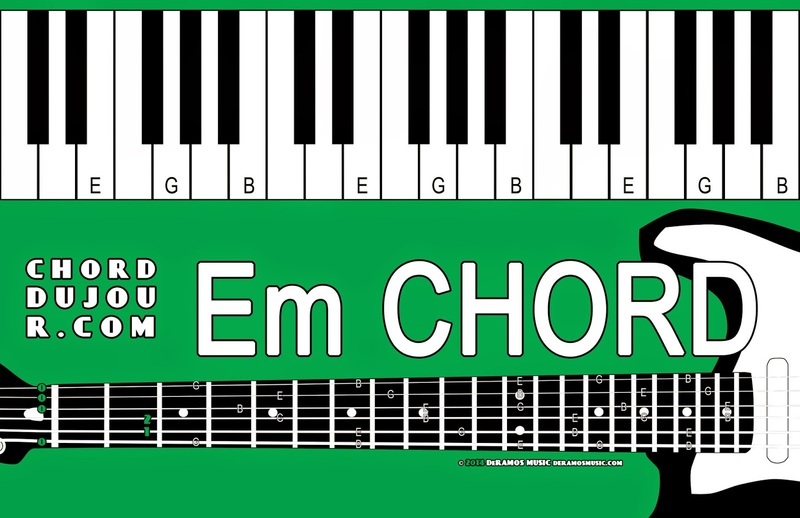 On the keyboard, the E, G, and B notes create a complete Em chord. A proper piano instructor can tell you which fingers to use, in a more formal learning setting. I am not a proper instructor by any stretch of the imagination. I just recommend you play with what's comfortable -- or least uncomfortable. The little finger, middle finger, and thumb are a good starting point for playing chords on the keyboard. However, the ring finger and the index finger will be useful when switching from chord to chord. If I recall correctly, it's said that the ring finger is the weakest finger for a keyboard player, so be sure to use that finger often to make it as strong as your other fingers! Guitarists, let's see if my chord map is understandable to you. Your index finger (1) goes on the _ string, behind the ___ fret. Your middle finger (2) goes on the low _ string, behind the ___ fret. Your ring finger (3) goes on the _ string, behind the ___ fret. Your little finger (4) goes on the high _ string, behind the ___ fret. 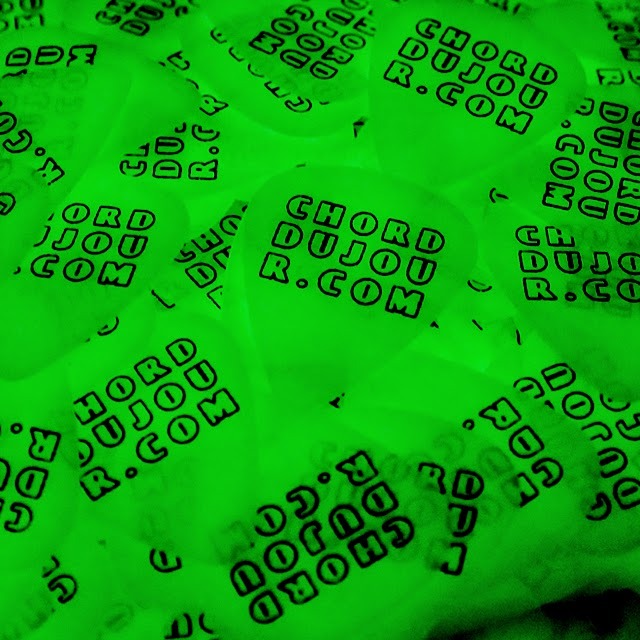 You leave the _ and _ strings open (o), and you strum all ___ strings for the G chord. Let's fill in the blanks: Your index finger (1) goes on the A string, behind the 2nd fret. Your middle finger (2) goes on the low E string, behind the 3rd fret. Your ring finger (3) goes on the B string, behind the 3rd fret. Your little finger (4) goes on the high E string, behind the 3rd fret. You leave the D and G strings open (o), and you strum all six strings for the G chord. 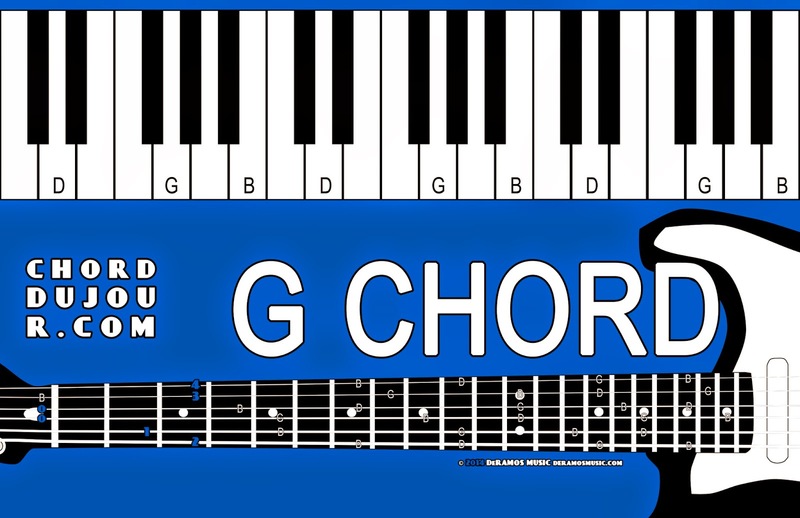 Keyboardists, the G chord is made up of the G, B, and D notes. Keep in mind that the G chord does not always have to be in that particular order, or even within the same octave. Invert the note order: B-D-G notes and D-G-B notes are also G major chords. Skip some octaves between notes: G-D-B is a possibility, but you'll likely have to use two hands. Play the same note in different octaves: G-B-D-G sounds a lot richer than the standard G-B-D, don't you think? You have the entire keyboard to explore! This has been a long lesson entry, but I thank you for your attention, as I applaud your commitment toward making beautiful music! Cheers!